Home / Favorite Things / Homemade Coffee Scrub and Mask – Just 2 Ingredients! 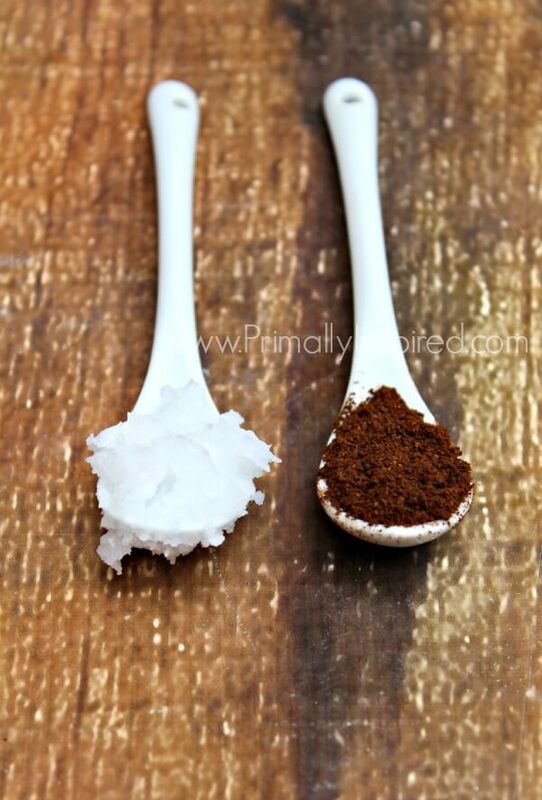 Homemade Coffee Scrub and Mask Recipe for Glowing Skin – Just 2 Ingredients! I’ve been a makeup and skincare junkie practically my whole life. Believe me when I tell you that no other store bought scrub, no matter how expensive, has even come close to this super simple homemade coffee scrub and mask. I get the best results from it! 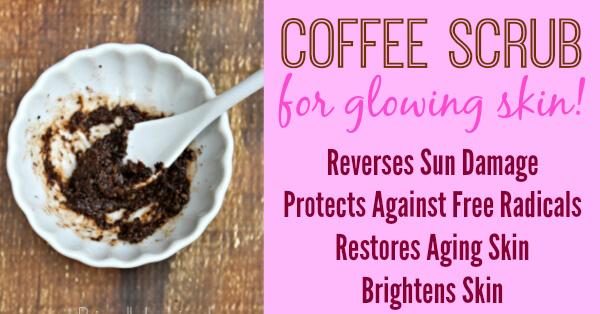 This homemade coffee scrub and mask sloughs away dead skin cells, deeply nourishes my skin and leaves me with a radiant, glowing complexion. It makes my face so smooth and bright. It’s the best! I especially love using it before a date or before something important when I want my skin to look it’s best. The immediate brightening, smoothing and line minimizing effects lasts for hours and hours! Recently, cosmetic manufacturers started putting coffee extract in many of their formulas. And for good reason! Coffee is a rich source of antioxidants that protects our skin against free radicals that damage and age us. The caffeine in coffee stimulates the skin and improves blood flow to the face, which is perfect for healthy cell turnover that makes us look radiant and bright. Another really cool benefit of coffee applied to the skin is that it increases the production of collagen and elastin. The caffeine in coffee minimizes fine lines and protects against the loss of moisture, making it the ideal choice for anti-aging. And if you have sun burned or sun damaged skin, you’ll be really happy to know that coffee helps reverse the damage of UV rays! So definitely make sure to slather this on if you happen to get too much sun or if you have sun damaged skin. 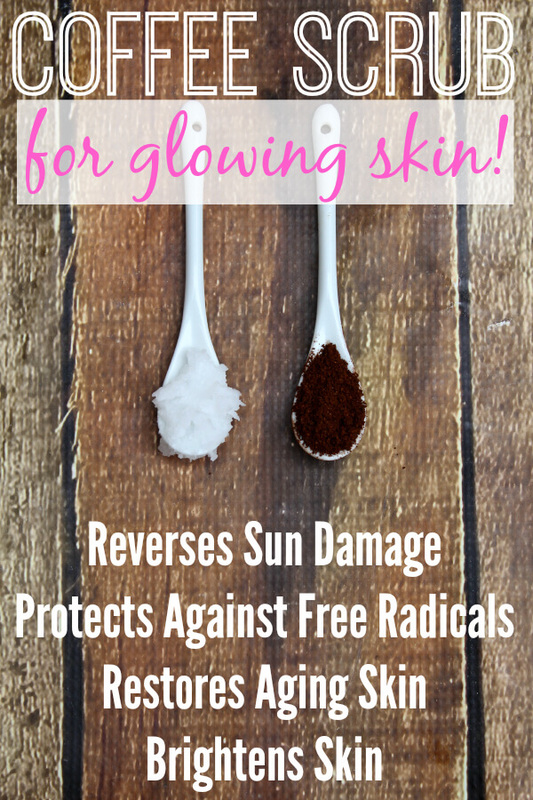 It will help restore your skin from damage! Just an FYI — You’ll want to use organic coffee beans for this. Coffee is among the most heavily chemically treated foods in the world! I love using THESE coffee beans. You already know how much I love my coconut oil for the skin. I use coconut oil for allthethings, but I especially enjoy using it for skincare. One of the best things about using coconut oil for skincare is that it suits all skin types. So whether you have dry, oily, acne prone, aging or sensitive skin, coconut oil can greatly benefit you. It’s deeply nourishing to the skin and loaded with protective antioxidants that protect the skin against premature aging and free radicals. It’s also antibacterial, antimicrobial and anti-fungal, making it a great choice for acne prone skin. To get the most bang for your buck and the best results, look for cold pressed, unrefined coconut oil. I use THIS coconut oil. You can find cold pressed, unrefined coconut oil in most grocery and health food stores. So whip up a batch of this easy, inexpensive homemade coffee scrub and mask using the recipe below and see for yourself why I’m such a raving fan of it! I think you’re going to love it just as much as me! 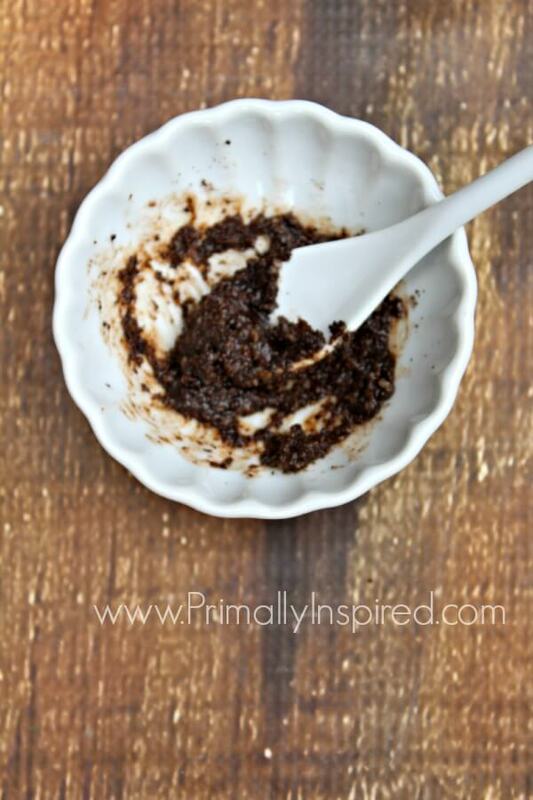 Homemade Coffee Scrub and Mask - Just 2 Ingredients! You can use this scrub and mask 2-3 times a week. Kelly. Can us guys use this too?! Yes!!! It’d be awesome for guys! This mask is amazing!!! Brightens my face and makes it so smooth. Hi Kelly! Just thought I’d pass along my weird eye treatment. I’m 49 years old, so I need all the help I can get! I took a coffee filter, cut it into 3 pieces. Then put about 1tsp.of coffee in the center of each piece. Then, pull up edges and twist.Tie with a small rubber band. Get yourself a small container (I used an empty rx bottle ) Put 2 tbsp. Coconut oil in it and submerge the bundles in it for a few days. Remove bundles and discard. Use under eyes morning and at. Bedtime. what a great tip, thank you Susan! And thank you Kelly for your recipe, can’t wait to try it! Just got into oil cleansing so anything oil on my face super fan of. Does used coffee grounds work or do they need to be fresh? You can do used coffee grounds, too, Debbie! They just won’t be as “potent” since they are used. Can i use the Nescafe coffee powder available in stores for this recipe? Can I store the unused mask in the refrigerator? I wonder if this would be good for everyday use? Or every other day? My skin is pretty dry. I just started using Bee Friendly (eye and face cream all in one) and I have extremely dry, sensitive skin. The honey is deeply moisturizing. There’s tons of honey masks out there as well. I got it on Amazon but believe it’s sold other places, and comes from Hawaii. Def best bang for the buck- as I’ve tried soooo many brands (Shiseido, Petr Thomas Roth, Kiehl’s, Lush, Clinique, drugstore brands like Aveeno, L’Oreal, Oil of Olay, etc). Great! I always have coffee beans and coconut oil on hand and I love natural skin care when possible. Thanks so much! Can this be lathered on the body too??? Wow, I can’t wait to try this! Going to try it tonight because I can’t wait. Here’s the crazy thing I put on my face. …I buy the huge aloe leaves in the produce section at Wegmans. I peel them and cut the insides into little chunks that I put in a jar and keep in the fridge. After cleaning my face (oil cleansing at night, raw honey in the morning) I take a chunk of aloe out of the fridge and rub it all over my face. It is so refreshing and seems to tighten and tone my skin. It’s a great makeup primer. Ooo! Love that, Elizabeth! I used to put aloe on my face (and hair! ), but haven’t in awhile. I blew through the leaves on my aloe plant so quickly doing that, but I love the idea of getting the big ones and doing it the way you do. I’ll have to keep an eye out for them. I don’t think my grocery store carries them, but I think I know a place where I’ll be able to find them. Thank you!! If you live near a ShopRite, they might have aloe leaves. The one I go to does. Whole Foods is another that might carry them, but they can be really pricey. Rub egg white all over your face. (Not the yolk just the white) Allow to dry. Rince off. Tightens the skin and minimizes lines and wrinkles instantly. Love that, Tina! I used to do that often and loved those results. I haven’t done it in so long (just forgot about it!) so thank you for reminding me! Ooo, I want to try it! Thanks, Beth! Can used coffee grounds work in this recipe? I’d like to use the grounds from my espresso machine after my morning coffee! Yes, awesome idea! We don’t drink coffee, so we rarely have leftover coffee grounds, but I think that’s a fabulous idea. That’s exactly what I do. I’m wearing it now while enjoying my coffee! Can you use ‘used’ coffee grounds? Helen, you can! We don’t drink coffee (gasp! I know! ), so we never have leftover coffee grounds. But you definitely can – great idea! I just bought a jar of it from wal mart but was $4 more Wished I’d seen this site last week. Can’t wait to try this. I use coconut oil for many things. Hey !!! Am happy to get this coffee idea … It’s better to try rather enjoying sip on a mug 😁 Thanks all .. ..
i use this mask regularly! I take used the morning’s coffee grounds mix in olive oil or a cream and blend into a paste. I also put in a bit of turmeric powder. In India turmeric is always used in face masks to make the skin glow and to prevent skin eruptions. Love the addition of turmeric, Hema! I’ve got to try it! Hema – How much turmeric do you add? 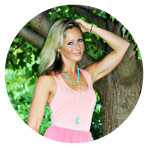 Turmeric stains… Be careful! Just a warning to the fairer few! May i know please,what can we use . instead of coconut oil?? Is there anything which can replace coconut oil…??!!! do you have to melt the coconut oil? Hi Lolly! No you don’t have to melt it. You can use it either in it’s solid or liquid state. Hi Roxanne…did this scrub help your cellulite? That’s a fabulous idea! I too use coffee grounds & coconut oil for cellulite. I didn’t know i could freeze. I was keeping a bunch of used grounds in a mason jar w a dab of coconut oil in my shower. I love the frozen version instead. Might work best as it’s kept fresh. Will try. Just last night i got curious & tried that mix on my face. Then AFTER i looked up if coffee scrubs r good for face. Luckily i found this site, or else would’ve regretted it haha I figured if It’s good for cellulite, bet it be great for my face. Just tried the coffee scrub. My face feels and looks amazing. I am 21 yrs old. .bt my skin is oily and dull.. can I use it?? Hi Baishali, Yes, this would be a great scrub for you to try! I think I will need to replace the coconut oil with something else (probably argan – I have lots of that). Coconut oil is actually one of the oils that is more likely for people have sensitivities to when used on the face. My skin is super sensitive and I break out like crazy if I use coconut oil on my face. It seems to work great if I use it pretty much anywhere else on my body…go figure. Hey Amy! Argan would be great. Every once in awhile I like to switch things up and use either olive oil or argan. Hope you are doing well!! How dooes this affect your drains??? That’s a good question. I’ve been using coconut oil for the last 10 (maybe closer to 12?) years for my face/body and in the shower for shaving and so far so good. We haven’t had any drain issues. Does anyone else have any long time experience – good or bad that can share? Coconut oil melts with very little heat. Just putting a dab in solid form in the palm of your hand will melt quickly. If you’re worried about it clogging, I would suggest running some hot water in the sink with a dash of dawn dish soap to break it up after you have finished with the oil. It shouldn’t really do any harm, but the dish soap could be a simple preventative measure. If I were to make a larger batch of this, is it safe to store? Or is making individual batches the best idea? Hi Kari – it’s safe to store! How would you recommend to store? In a closed glass jar away from sunlight and heat. In that case it will last as long as the expiration date on the oil you used (normally 1-2 years). but I have sensitive acne prone skin (with some new wrinkles too :/ I am only 27 years old though) is it ok for me?! Hi Fahi! Yes, I’d give it a try and see how your skin likes it! 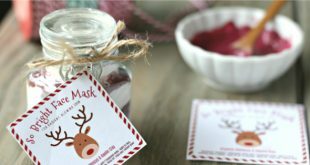 But something else that works really well for visible pores is my deep pore cleansing mask recipe — http://www.primallyinspired.com/deep-pore-cleansing-mask-recipe/ I think you’ll really like that one and notice a big difference. I use coffee scrub with yogurt. It use natural organisation plain yogurt combine these two spoon of each. Scrub motions circular allover. Rinse with warm water. Twice a week. Then moisturise. When l scrub l don’t use use soap. I use jojoba and almond oil to moisture at nights. My skin is super sensitive. Lemon scrub aloe vera just burn it desperately. Hi! I just have Columbian grounded up coffee beans tjat aren’t organic! Is that bad? Hi Alexis! If it doesn’t bother you, that’s just fine – all the skin benefits are the same with either organic or non-organic. Coffee is one of the most heavily treated (with pesticides) crops so it’s one of those things that I recommend buying organic. I personally don’t like the idea of rubbing on my face (or drinking!) pesticide residue so I make it a point to buy organic coffee. By the way, if you are near a Costco, they sell a great organic coffee that’s very inexpensive! is it possible to make this in a pot? how long does it keep? Hi Jessy! It keeps for as long as the oil is good for – usually that’s 1-2 years! And yes, you could make it in a pot. Hi, do you have any suggestions on another oil that I could use for this? I have had very bad reactions to coconut oil. Hi Dariea! You could use any facial oil that works for your skin. Popular face oils are jojoba oil (especially great for sensitive skin), sweet almond oil, rosehip oil or olive oil. I love this and use it. I have an issue with my drain getting clogged. Any ideas! Hmmmm…..what about wiping it off with a disposable facial cloth or paper towel that you could throw away? Anyone else have any other ideas? Use a large bowl filled with water to rinse your face and just dump the water outside. You could also use wet paper towels or even grab a tub of unscented baby wipes. My daughter often used her sons baby wipes as a makeup remover wipe. Great idea, Lottie! Thank you! I used this and added 1/2 tsp of brown sugar as well. When I was done, I used what was left of the scrub on my hands since they are dry and scaly and my hands felt wonderful after! Thanks for sharing this!! Great idea with the brown sugar, Terri! Hi Kelly. I’m in college and we need to have ideas for product we are gonna sell. And I found out that this coffee scrub is a great idea. If you dont mind, you’ll be one of the sources and courtesy for this project. Thank you so much. Love this DIY! Definitely going to give this a try. I just wanted to know whether it’s recommended to use it in the morning or at night. Hi Sambi! You can use it anytime, but I prefer to use it in the morning or afternoon only because coffee is a stimulant and even the smell of it has the ability to hinder sleep in some people. Hi Kelly. Since Grapeseed Oil is noncomedogenic, do you think that’s a good alternative to Coconut Oil? I love trying different ‘all natural diy’ skincare. I am looking for something that suits my skin. Acne has been an issue since my late teens, I am now 53. I have tried the coffee mask and I love I!! I add cinnamon and raw honey. My face feels wonderful! I do love the Coconut oil but I use as an after shower moisturizer. I truly enjoy reading all the questions and all your great answers. Thanks!! Hi Cindy! I love your additions of cinnamon and raw honey! I will have to try it. Yes, I think Grapeseed Oil would be a great choice and substitute. I’ve also been really loving Rosehip oil lately. Like grapeseed oil, it’s super lightweight, absorbs easily into the skin and is really nourishing, especially for aging skin. It’s been my favorite facial oil for the past few months. Hello I’d love to try this. Will the effects of the mask last all day? I know caffeine is supposed to tighten up the skin but I was wondering if it would help reduce the look of my under eye bags all day, rather then just a couple of hours. When there’s something important coming up e.g. date with my boyfriend, appointment at work, there’s no way my whole body and face could go without a coffee coconut scrub before. There’s nothing that could go possibly wrong when my body shines bright like a diamond and feels like a fresh picked peach! If I don’t find the time to do my routine I don’t feel perfectly prepared! Can i use this to wash my body? Yes, you can use it for your body, too. Hi I was wondering how close to the event do you do this to get the best results?? Hi Hannah! I do it about an hour before I have to leave. Is it suitable for oily skin in summers? Hii Kelly can I use cofee powder instead of organic cofee beans. Can you tell me which one is better cofee powder or cofee beans ? Coffee powder would be great, Sonali! Hi Kelly can I use used coffee grinds as I use coffee beans in my machine, or does it have to be freshly ground coffee. 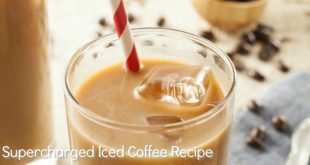 You can use used coffee beans – I often do! Hi Rosemarie, It can be used coffee grinds! Enjoy! Can one use coffee grounds that were freshly brewed? Omg! Just tried this and loved it! Hello! Can I use this on peeling skin that was sunburned just last week? I have used coconut oil, apple cider vinegar and aloe vera but I am still peeling and have two tone skin. I would like some help with the the two tone skin and or sun spots! help!!! Please!!! Yes! This is so nourishing to sunburned and sun damaged skin. You could even add a few cuts from aloe vera gel straight from the leaf. It will reduce swelling and redness as well. Also another great substitute for people with sensible skin, use shea butter as it is non comedogenic. Coconut is at level 1 of comedogenic bar. I love it on my body, but prefer shea butter or mango butter for the face. Will it work on large pores? Are you using used or unused coffee grounds? Most coffee scrubs call for used grounds but Icouldnt tell on yours and I really want to try it. I most often use fresh coffee grounds, Vivian, but you can certainly use either! Whatever I have free or is easiest at the moment is what I usually do 🙂 Fresh coffee grounds will give you more nutrients/benefit just because they haven’t been used yet. But there are still many nutrients left in used coffee grounds, too. Hope you love it! I am interested in making this for a bridal shower as gifts, can I mix the two and put them in a mason jar? Or should they stay separate until someone is about to put them on? Thank you! That’s a great idea, Jenna! You an mix the two ahead of time! Can’t wait to give to give this a try. It’s so simple and hopefully really effective. Thanks for sharing! Great post! Also,do you wash your face after the using the mask, so you could follow your makeup routine? do you think ginger powder or cinnamon is a good addition? I think that’s a great idea, Jessica! If you have sensitive or dry skin, cinnamon may irritate it, but otherwise, cinnamon does have some great skin benefits (really good for acne, especially). I have it on my face as I type. I made a batch that will last me for a bit (from used grounds). I also added a couple of drops of Lavender, Fennel and Lemon essential oils. My face is extremely dry – especially since I’m apparently in what I pray are the later stages of menopause. I’ve never tried this but it makes sense so I’m giving it a shot. Thanks. I’ll try to come back and add an after comment. It feels GREAT on my face. Yes I use that one too. My face feels great and looks so much better today! Great little tip! Thanks! Nice post! I love that you explained the innate effects of coffee and coconut oil on our skin. 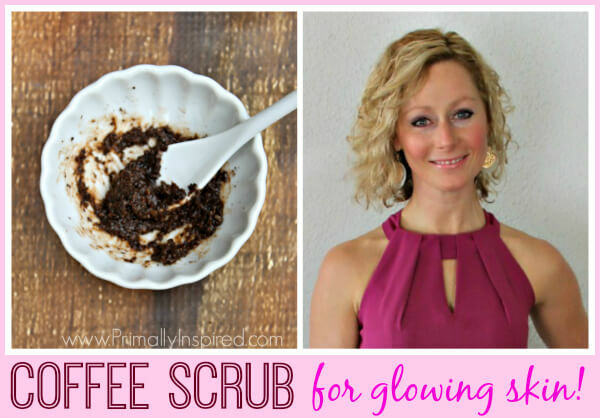 Coffee scrubs are awesome-ly effective! Hello loved reeading this as I’ve been using this for quite some time now. Even my 20 yr old daughter is hooked. She has always complimented my skin. I recommend and sometimes do batches for friends. They always say their friends ask what they r doing different. Just recently i started using frankincense pure and natural oil. It’s amazing. Yvette, thanks for your comment! I LOVE frankincense essential oil for skin, too! It’s my favorite! I tried to used all kind of oil but still I’m having a pimples anything to mix with the coffee with out any oil.? 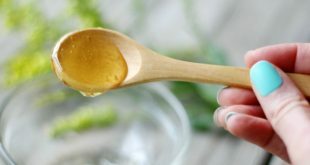 Hi Joyce, I know this may sound a bit crazy, but raw honey is exceptionally good and effective for pimples and acne and would be a really great solution for you! My name is Joy from nigeria and we don’t have the coffee beans here.pls can you just mention a particular coffee I can get from the supermarket? Any coffee will work, Joy. I like to try to find organic coffee (any brand) if possible. Wow this is amazing my skin feels so smooth and is truly glowing!!! Thank you so much!!! Hi Nakshathra, in general it’s recommended to use scrubs a few times a week (or less if you have sensitive skin). If you use scrubs too often it could irritate the skin. 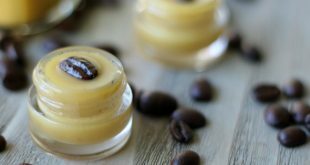 If you grind the coffee very, very finely so it’s a very gentle scrub, I think you could definitely get away with daily use, but it’s always best to listen to your skin…if it seems to get irritated, cut back on the daily use. Is it possible to make a batch of this or should it be made fresh with each use? Hi Shelley, as long as you use fresh coffee grounds you can make a big batch of this and it’s good for as long as the expiration date on the coconut oil (usually 1-2 years or more). Used coffee grounds will introduce a bit of water into the mix and can go bad easily – that’s why it’s important to use fresh for big batches. Enjoy! using my regular moisturizer and egg whites is a great alternative for people, such as myself, with strong coconut allergies! Thanks for the post. I have dark sunburn marks that seem not to go away. I have tried some creams for years now but nothing seem to be working. Will definitely try this one. Big thank for good & easy method for body scrub. Hey Kelly, just wanted to ask that after this scrub is it fine to use a face wash? Allergic to coconut do you have an alternative ? Hi Helen, you could do olive oil or your favorite facial oil instead of the coconut oil. My favorite facial oils are rosehip oil and argan oil and I’ve used them often in this coffee scrub. Thank you for this article. I must try! Do I need to apply moisturizer after this scrub and how frequently can i use it for oilt acne prone skin? I live in hot humid place. Hi Sato, I use a moisturizer after this scrub, but if you have really oily skin you may find that you don’t need any. You can use it up to 4 times a week. Take care! 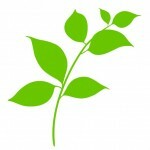 Cera, I love using rosehip oil as an alternative (and it’s great for sensitive skin! ), but you could use any oil that your skin tolerates well. Jojoba oil is another good one. Can v use it for tanned skin? actually I am a sports teacher and have a badly damaged and tanned skin. Plz suggest. Yes, this would be great for you! Cam you use used coffee grounds or does it have to be fresh coffee grounds? You can definitely use used coffee grounds, Misty – I often do. It just won’t be as “potent”…many of the nutrients/antioxidants/caffeine will be much less than if you used fresh grounds, but it still makes a wonderful scrub! Yum! This looks so simple and refreshing! Can’t wait to try it! Can I use used coffee? Would I have to dry it first? What kind of coconut oil, the odorless? Nicola, you can use used coffee grounds – no need to dry them. Also, any coconut will work great! Kelly how many times can we apply this scrub on face within the week? I would suggest 2 times a week. Kelly I drink “Great Value Colombian Ground Coffee”. Do you think this brand is acceptable for the scrub?